This is a professional True Type (TTF) PDF417 Barcode Font package that is designed for use in modern operating systems. 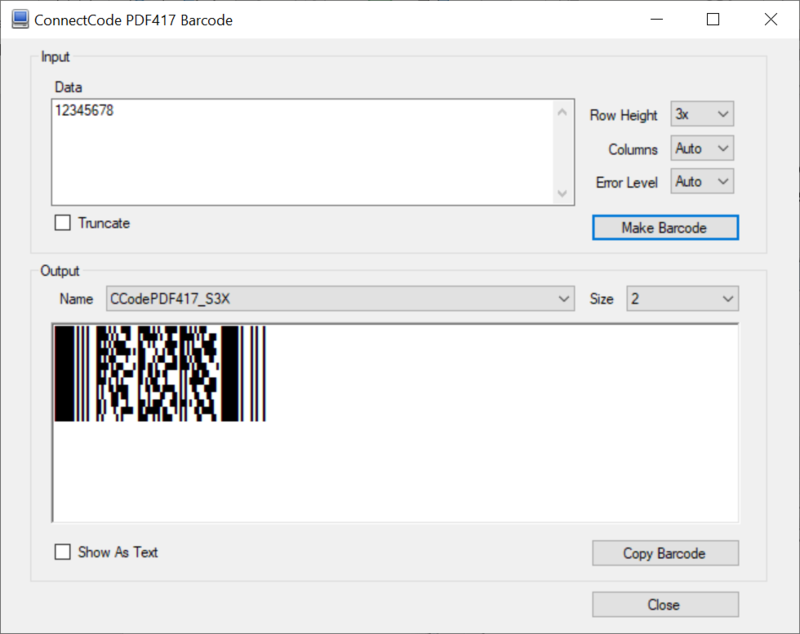 It allows you to create the PDF417 barcode by selecting a font in your favourite text editor or reporting tool. The following are the list of barcode fonts used by the PDF417 barcode. Different types of fonts have been designed for different types of applications. This is to achieve the most optimal scanning possible. This is the set of fonts to be used with Microsoft Office (Word, Excel and Powerpoint), Crystal Reports, Access and other reporting/publishing tools. CCodePDF417_S3 - PDF417 Barcode with a row height of 3x the column width. CCodePDF417_S4 - PDF417 Barcode with a row height of 4x the column width. CCodePDF417_S3X - PDF417 Barcode with a row height of 3x the column width. CCodePDF417_S4X - PDF417 Barcode with a row height of 4x the column width. PDF417 barcode is one of the earliest and most widely used 2-dimensional barcode. It is a stacked barcode composed of rows of linear barcode. Being a 2-dimensional barcode allows it to carry more information than the 1-dimensional barcodes. "PDF" stands for Portable Data File. The "417" derives from the fact that each encoded codeword in the barcode is represented by four bars and four spaces. The total width of each codeword is 17-module wide and thus the "17" in the name. Besides being able to pack more data, the PDF417 barcode provides additional redundancy by using a correction technique known as the Reed Solomon error correction. This allows the barcode to be partially damaged without causing any loss of data. Under the industry specifications, a total of 9 levels of error corrections are supported. The higher the level of error correction, the more redundancy the barcode has. However it also means that more areas from the barcode will need to be used for error correction and resulting in less data to be encoded into the barcode. The PDF417 barcode supports the following compaction mode. Different compaction mode allows different types of data to be encoded optimally into the barcode. Binary - Data Bytes. A maximum of 1.2 bytes per codeword. Text - Text Characters e.g. ASCII 32 to ASCII 127. A maximum of 2 characters per codeword. Numbers -Digits from 0..9. A maximum of 2.9 digits per codeword. ConnectCode provides automatic compaction based on the above compaction mode according to the AIMS industry specifications. The algorithm used first scans the data and decides automatically which compaction mode to use. On top of that, the data can sometimes consist of a combination of binary data, text and numbers data. In this case, the algorithm will automatically switch between the different modes to provide the maximum compaction. The following list the different configurable parameters of the PDF417 barcode. If you are new to this barcode, it is recommended that you use the default or automatic settings mentioned below. The Row Height of the PDF417 Barcode is specified as a multiple over the column width. For example, "3x" means the row is 3 times the height of the column width. This specification of row height is according the industry specifications. 3x - This is the default row height supported. It is also the most commonly used row height. 4x - The row height is 4 times the column width. A PDF417 barcode will typically expand vertically by adding rows to accommodate more data. However, the barcode can also be expanded horizontally by expanding the number of columns. The diagram below shows a PDF417 barcode with 1 column. You probably see 3 columns below, but it is considered 1 data column. The PDF417 barcode encoded with the same data but with 2 columns is shown in the diagram below. Auto - This is the recommended setting if you have not used the PDF417 barcode before. The ConnectCode PDF417 Barcode will automatically detect the optimal columns according to industry specifications. The list below shows all the error correction level supported by the PDF417 barcode. A higher error correction level will mean a more robust barcode that can withstand more damage. However it will also means that less data can be encoded into the barcode. 0 - Support 2 error codewords. This is the minimum Error Correction Level. 1 - Support 4 error codewords. 2 - Support 8 error codewords. 3 - Support 16 error codewords. 4 - Support 32 error codewords. 5 - Support 64 error codewords. 6 - Support 128 error codewords. 7 - Support 256 error codewords. 8 - Support 512 error codewords. This is the maximum Error Correction Level. Auto - This is the recommended settings if you have not used the PDF417 barcode before. The ConnectCode PDF417 Barcode will automatically detect the optimal Error Level. The right hand side of the PDF417 barcode can be truncated (removed) without causing any loss of data. This allows the creation of a barcode that takes up smaller amount of space than a normal PDF417 barcode. The diagram below shows a Truncated PDF417 Barcode. 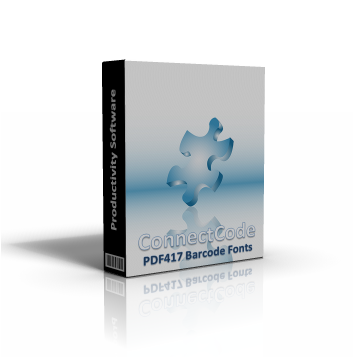 The PDF417 Barcode Font package in ConnectCode comes bundled with a Font Encoder that allows you to encode the barcode quickly and easily. This is useful if you will like to encode a single barcode to be pasted into your brochure, packaging or product items. The Encoder supports all the different parameters as described in the sections above. The Row Height, Columns, Truncate and Error Level are parameters that have been described in the previous section and thus will not be described again here. The Font Name and Font Size in the "Output" section can be changed after the PDF417 barcode is created. This allows the height and the size of the barcode to be changed after the barcode is created. The "Show As Text" option allows you to see the text output of the barcode in a normal text font. The "Copy Barcode" button allows the barcode to be copied onto the clipboard of Microsoft Windows. This allows you to paste the barcode onto other applications easily. A .Net Barcode SDK is also bundled in the ConnectCode PDF417 Barcode Font package. This SDK can be bundled in your applications if you have purchased the necessary distribution licenses. This is the constructor for the PDF417 barcode. It is used for initializing the PDF417 barcode. truncate : 0 for non truncated PDF417 barcode. 1 for truncated. This function will encode the barcode based on the parameters specified in the constructor. The result will be returned as a string. The Encode() function might return an empty output string due to invalid inputs or if the length of the data exceeded the length specified by the PDF417 specifications. A call to this function after the Encode() function will allow you to determine whether the data length has exceeded. During the creation of the PDF417 barcode, if the number of columns used is "Automatic", the font library will automatically determine the optimal columns. This function can be called after the Encode() function to return the number of columns that is determined by the library. During the creation of the PDF417 barcode, if the error correction level used is "Automatic", the font library will automatically determine the optimal error correction level. This function can be called after the Encode() function to return the error correction level that is determined by the library. Requirements - .Net 2.0 and onwards, Visual Studio 2005, 2008, 2010, 2012, 2015 and onwards. 2. Open the Field Explorer. 3. Create a new formula by right clicking Formula Field and select New. Name the formula "pdf417". 4. Set the syntax of the formula to 'Basic Syntax' in the Formula Workshop. 5. Copy the formula for the barcode that you intend to use from the file CR_Formula.txt to the Crystal Report's Formula Editor. 6. Modify the 'data = "90807060' statement with data from your data source. Please note that the trial version of the software only allows you to encode numbers in the PDF417 barcode. 8. Create the barcode by dragging the pdf417 formula to your report. 9. Set the font of the formula field to "CCodePDF417_S3" or "CCodePDF417_S4". For a detailed tutorial with screenshots, please see the Integrating Barcodes with Crystal Reports tutorial. This function returns the encoded barcode string for the PDF417 barcode. Invalid characters from the input will be automatically removed. The font name to use with this barcode is CCodePDF417_S3. Param 1 - String value to be encoded as a barcode. Param 2 - Number of Columns in the PDF417 barcode. 1..30 or 0 for Automatic. Param 3 - The Error Correction Level. 0..8 or -1 for Automatic. Param 4 - 0 for non truncated PDF417 barcode. 1 for truncated. 1. In Access, select the textbox for the PDF417 barcode in the Design View. 2. Click on Properties->Data tab. 3. In the Text Format property, select Rich Text. Please note that the trial only allows you to encode numbers into the barcode. Install .Net DLL, VBA formulas and Crystal Reports formulas into the Resource subfolder. On your system, go to "C:\Program Files (x86)\ConnectCodePDF417Trial" or the location where the software is installed. For Windows Server 2003/2008/2012, it is recommended that you choose "No" when the installer requests to setup the fonts for you automatically. After the installation, follow the steps below to setup the fonts for your server.